At last post, we were headed down I-5 towards Vancouver, Washington. Driving through Seattle (or in my case riding) pulling our fifth-wheel was quite interesting. The road is way crowded and very much in need of repair. On one of the many times we were at a complete stop, I saw the University of Washington stadium and wondered how Coach Pete was adapting to Seattle traffic. Ironically, just a few days later when he was being interviewed at the Pac-12 media days, he mentioned Seattle traffic. We eventually did make it safely to my parent’s home in Vancouver. We enjoyed an “Amazon Christmas” of sorts. After many weeks on the road we knew the modifications we wanted to make to the trailer. These included a second air-conditioner, an upgraded mattress and a variety of other miscellaneous things. We had all those things shipped to my parent’s house and spent some time unpacking boxes and making those changes. 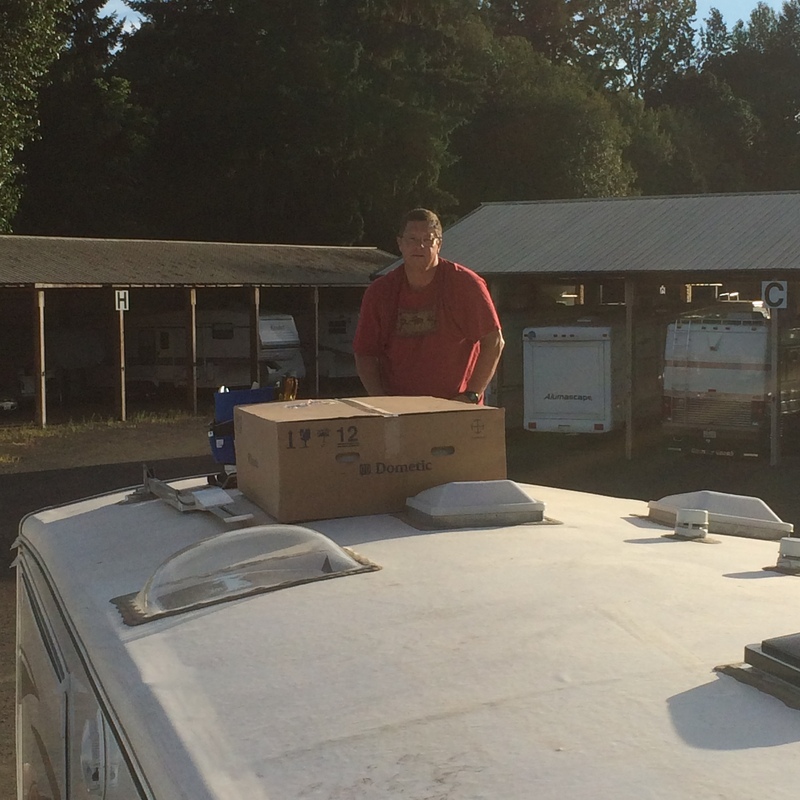 See Randy getting ready to start installing our new 100 lb. air-conditioner. Getting it up there was interesting! While in Vancouver we also enjoyed Music in the Park and visiting. 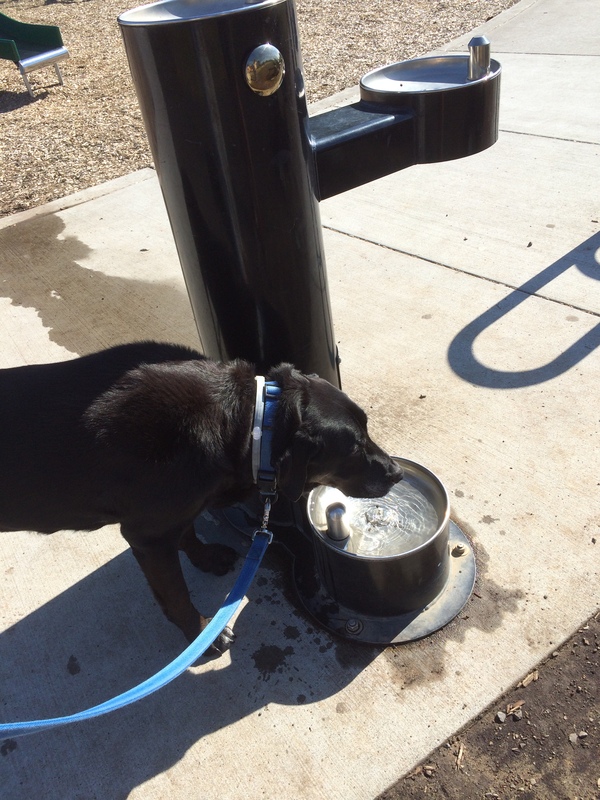 There is a neighborhood park within walking distance of my parents’ home where Elko is able to enjoy the dog drinking fountain. Vancouver is a nice town. And then, Elko became the “one if by land” staying with my parents, while Randy and I became the “two if by sea”, going on an Alaskan Cruise. We are a little bit attached to Elko and are grateful to my parents for taking him in. My mom took good care of Elko even though spoiling dogs is not in her nature. My dad loved him and spoiled him because it is exactly in his nature. I don’t think I knew growing up that mom didn’t really like pets because my brother and I had dogs, cats, hamsters, mice, birds and even a monkey at one time! Leaving Elko behind, Randy and I took off on a Sunday morning to family friend Kim’s house near Seattle. She had graciously volunteered to keep our truck and shuttle us back and forth to the Holland America Pier in Seattle. We found Boise friends Darrell and Cindy almost immediately and were able to board the ship together, find our cabins, have lunch and explore the ship. We had a great time! 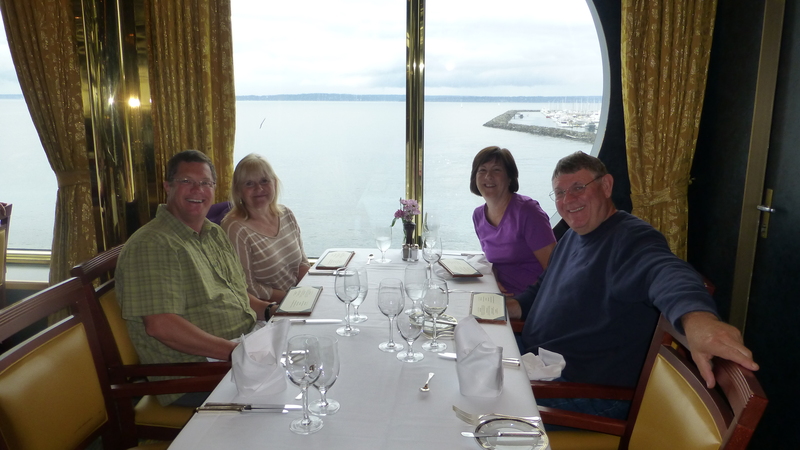 This was our second cruise to Alaska and for the most part we went to different places which was nice. 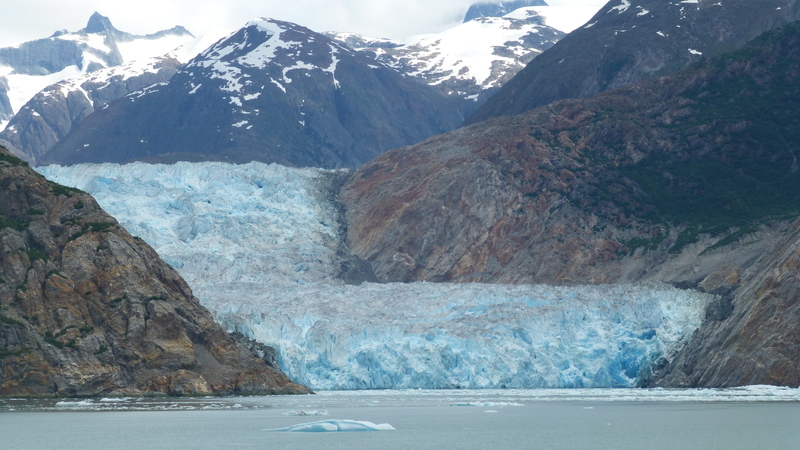 On our first Sea Day, we went to the Tracy Arm Fjord where we got up close and personal with the Sawyer Glacier and saw icebergs, seals and orcas. In Juneau, we went on a tour where we saw humpback whales “bubble netting”. This is a technique in which Alaskan humpback whales coordinate to catch herring in a bubble circle and then feast on them. We were fortunate to be at the right place and time when the herring and whale migrations overlap. There is usually about a two week window of opportunity each year and we caught the end of it. Here is a Youtube video of bubble net feeding. We enjoyed additional port days in Sitka, Ketchikan and Victoria, BC. We were able to get our sightseeing done each day before the weather became problematic. 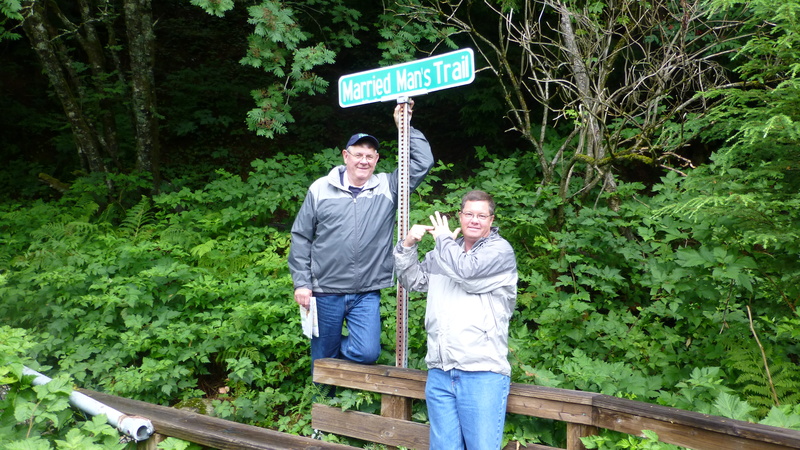 See Darrell and Randy on Married Man’s Trail – the back way in to Ketchikan’s Crooked Creek of brothels – turned tourist shops. Along crooked creek we were able to see many salmon attempting to go upstream to spawn. We also really enjoyed our ship time. We spent time in the Piano Bar most evenings doing things like team competitions for Neal Diamond Name that Tune (we were respectable thanks to Cindy’s Neal Diamond passion) and the Beatles Name that Tune (we were not). We watched a few shows, went to a few classes and saw a couple movies. Our ship, The Amsterdam, was very nice,. The food was great and the ship’s crew were so gracious. I’m already looking forward to our next cruise in a couple years– anyone interested in cruising the Mediterranean? 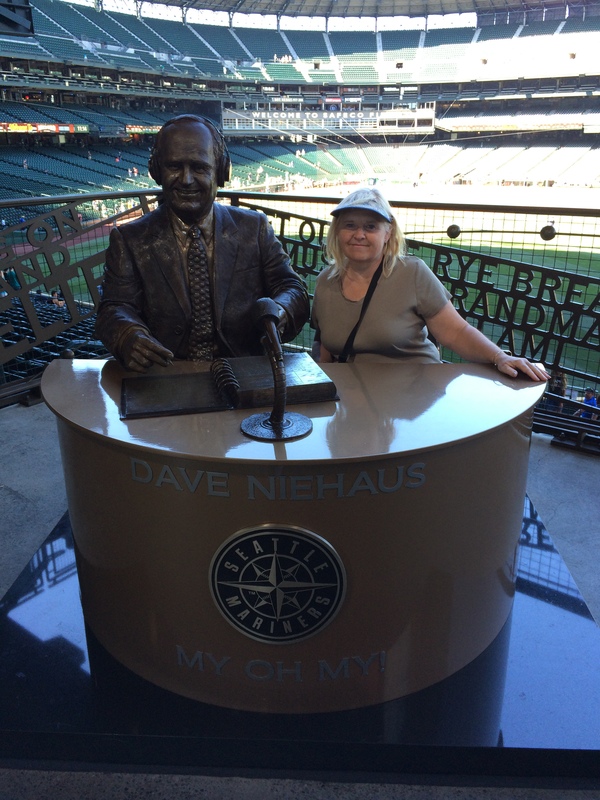 Back on land, Randy and I went to Safeco field. We were there a couple of hours early for the Mariner’s game but we enjoyed wandering around the stadium. 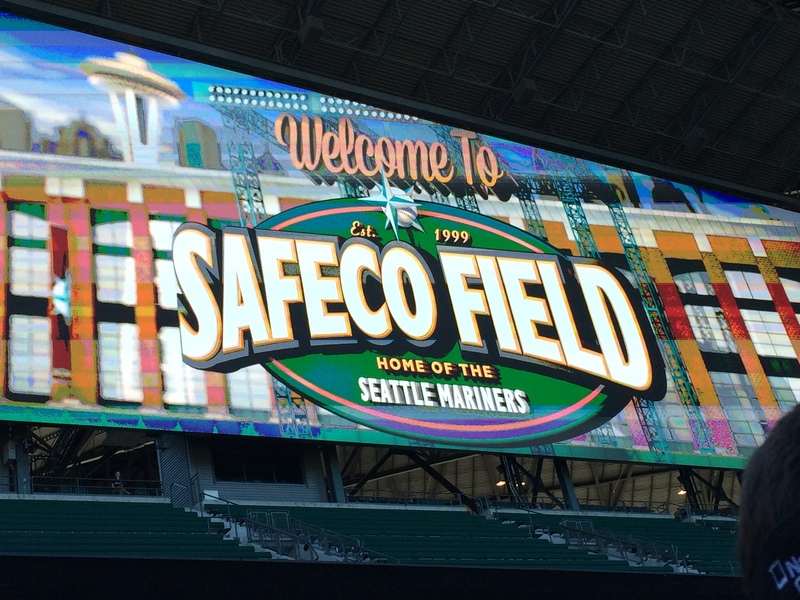 We went to the Mariner’s Hall of Fame and saw the induction speeches of those going into the Baseball Hall of Fame in Cooperstown on Seattle’s very big video board. The Mariners lost, but we had a good time. Then we headed back to Vancouver and reunited with Elko and my parents. We enjoyed a few more days there where Randy drove his old BMW again and we saw a Boise Hawks Baseball game – in Hillsboro, Oregon. And now, we are on the road again! Unfortunately we had to traverse more of the I-5 corridor heading south through Portland but we survived and are now on the Nehalem Bay near the Oregon coast. More to come later in the week! And thanks again for babysitting our truck and shuttling us back and forth!